reverse global environmental and social degradation." As the green economy starts to take hold, just about every major media outlet has featured green themes or dedicated issues to the emerging and rapidly growing sustainability and relocalization movements and the ecopreneurs who are leading them. Below are a few of the many media covering the explosive growth in ecopreneuring or the rural renaissance. E The Environmental Magazine, "Putting the 'Eco' in Tourism: 10 Journeys That Just Might Change the World...or At Least Your View of It"
Ecopreneuring, Putting purpose and the planet before profitsJohn Ivanko talks with Teri about the explosion of Ecopreneuring and what it means for our futures. This is on my list of reads! 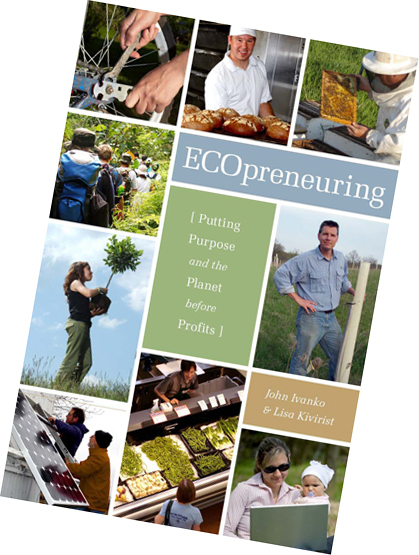 Join us and our guests Lisa Kivirist & John Ivanko Co-Authors of ECOpreneuring, Rural Renaissance, Edible Earth to learn how we can grow our own food and empower our local farmers, growers and markets to promote sustainable living. Lisa and John own a farm and B&B in Browntown, Wisconsin and will be sharing their life experiences with us of how they have transformed their lives to empowering a rural renaissance of the Earth. This dynamic couple presents a compact tool kit for a fresh approach to entrepreneurial thinking. Blending passion for the planet with small business pragmatics, ECOpreneuring smashes the stereotype that "doing good" and "running a business" are two different realms. It's an engaging show that will change the way you do business.